Colonel Robert L. von Tersch was a distinguished military graduate from Fordham University, Bronx, New York, where he earned a bachelor of science in chemistry under an ROTC scholarship. He earned his doctorate in biochemistry from the University of Georgia in 1991. Colonel von Tersch came on active duty in 1992 and was assigned to the U.S. Army Medical Research Institute of Chemical Defense (USAMRICD), Aberdeen Proving Ground, Maryland, as a principal investigator. Subsequently he served as an assistant professor in the Chemistry Department, U.S. Naval Academy, teaching general chemistry, biochemistry, and biology; as the scientific advisor for chemical and biological warfare issues in the Office of Chemical, Biological and Missile Nonproliferation, U.S. Department of State (1999 - 2003), and as the deputy director, Office of Research Plans and Programs, U.S. Army Medical Research and Materiel Command (USAMRMC), Fort Detrick, Maryland. In August 2003, he deployed for a four-month tour in Iraq, where he served as manager of the Ministry of Trade Oil-for-Food (OFF) Transition Team and as the deputy director of the OFF Coordination Center. He returned to the USAMRMC and was later assigned as deputy director/USAMRMC liaison to Medical Chemical, Biological, Radiological, and Nuclear Defense Health Policy, Office of the Assistant Secretary of Defense for Health Affairs. A tour at the Defense Intelligence Agency, Directorate for MASINT and Technical Collection, as deputy chief and then acting chief for the Office for Counter proliferation followed; he also returned to Iraq as commander, Office for Counterproliferation – Iraq Detachment, Defense Intelligence Support Office – Iraq, Multi-National Forces. In 2008, he was assigned to the Joint Staff, serving as the chief, Medical Branch, Joint Requirements Office for Chemical, Biological, Radiological, and Nuclear Defense, J8, which was followed by a tour as the deputy and medical director, Chemical-Biological Defense Programs Office of the Assistant Secretary of Defense for Nuclear, Chemical, and Biological Defense/Chemical and Biological Defense Programs. 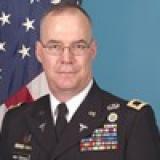 Most recently, he served as the director of the Strategic Partnership Office at the USAMRMC. His awards, decorations, and badges include the Defense Superior Service Medal, Defense Meritorious Service Medal (3 Awards), Army Meritorious Service Medal (2 Awards), Army Commendation Medal, Joint Service Achievement Medal, Army Achievement Medal, Department of State Superior Honor Award (3 Awards), Department of State Meritorious Honor Award, Joint Meritorious Unit Award, Naval Meritorious Unit Commendation, U.S. Naval Academy, National Defense Service Medal (2 Awards), Iraq Campaign Medal, Global War on Terrorism Expeditionary Medal, Global War on Terrorism Service Medal, Armed Forces Reserve Medal with M Device, Army Service Ribbon, Parachutist Badge, Craftmaster Badge, Office of the Secretary of Defense Staff Badge, Joint Staff Badge, OSD Group Achievement Award, and The Surgeon General’s “A” Proficiency Designator in biochemistry. He has authored or co-authored 15 open literature publications as well as a book chapter, and several proceedings papers and United Nations resolutions. Additionally, he is a member of the American Chemical Society and has served as treasurer and chairman of the Maryland Section.